Do you want to improve conception rates by lowering your stress during your IVF cycle? Studies show conception rates increase when patients submit to a stress reduction program. This home program will allow you to do just that, increase your possibility of conceiving through lowering your stress, inducing hormonal balance in the brain and body, help transform challenging emotions and empower you during this challenging time. You have heard over and over again, that stress plays an important role in your ability to conceive. Yet you find that it is quiet impossible to just relax, as a matter of fact, the more you tell yourself to relax, the more that you become anxious about not being able to relax. In response to thousands of fertility patients that Dr. Murciano has supported since 2000, she has created an on-line course to help act as a support and a guide during your IVF cycle. Listening to a series of Transforming Meditations, Cultivation Practices, Reflection Practices & Visualizations and a step by step E-Book guide will help not only in “relaxing you” physically and mentally, but in playing an active contributing role in the success of your IVF process. It is important that you remember that what you think and what you believe affects how your cells behave and the chemical processes in your body, as documented by Quantum science. What you are feeling affects how your body responds to treatment. It is crucial for you to address the negative stress in this situation and allow yourself the tools necessary to transform the worries, fears and negative emotions that are so very real at this time, and allow yourself to be empowered during this process. This program provides you the tools and guidance to do that. This is an on-line course based on Quantum medicine & Traditional wisdom is designed to support your body and mind during the 4- 6 weeks of your IVF protocol. It is common for an IVF cycle to induce many unwanted feelings and emotions, as well as stressors during its cycle causing excess anxiety, nervousness, feelings of vulnerability, loss of control, lack of direction, as well as the day to day reality of not knowing what will happen next. Your body and mind are put through an enormous amount of change in a few weeks, leaving you feeling helpless, disoriented and sometimes exhausted. Many patients complain about the intensity of these feelings and thoughts, which of course do not contribute to an easy process. Moments of helplessness; fear of disappointment and failure can creep in and cause even more stress. If we are able to have a coach with us, receiving guidance and support for our minds, and help us make sense of what we are experiencing, giving us emotional and mental support while transforming our fears and worries into strength and direction, then we are able to move through this vulnerable and challenging stage of our lives with less stress and more ease, benefiting our end result of creating life. This program is designed to help you navigate the challenging emotions and thoughts that seem to surface and over power you at this time, helping you feel prepared and guiding you into reconnection with your deepest purpose of becoming a mother; the unconditional love you carry within. Through principles of Quantum Science, it will begin to transform the thoughts, feelings and even unconscious attitudes that we carry in our subtle bodies that many times affect our health, healing and wellness in the physical body. These unconscious feelings may creep up when we have had prior disappointments and now our body/mind is anticipating the fear of the disappointment happening again, or perhaps we feel hopeless and are projecting that hopelessness into your upcoming IVF process. There are many reasons why your thoughts, feelings and perceptions behave the way they do, and this program is designed to transform the limiting conditioning (feelings, thoughts, perceptions, beliefs) and empower you with your own strengths. It is a companion to guide you through your IVF process with ease and strength, instead of being ruled by anxiety and doubts. Based on cutting edge scientific foundation of Quantum Science; Fertility Wisdom IVF on-line course addresses our energetic bodies as well as the physical body. Quantum science recognizes that the human body is controlled and affected by the human energy system, therefore giving full acknowledgement to therapies that affect the energetic (subtle) bodies; emotional, mental and supra mental (where meaning is found). By proving the existence and interconnectedness of this field of consciousness that contain emotions, mental images, perceptions, beliefs and meaning; Quantum science substantiates the fact that our physical bodies are consciously affected by these levels of consciousness and therefore, in order to address disorders we must address the interacting conscious field. This is exactly what the Fertility Wisdom IVF on-line program does; it addresses the underling conscious field that contain the limiting conditioning, in order to allow our consciousness to open, evolve and create health and wellness in our physical bodies. By addressing the underling conditioning patterns stored in our conscious field we can release the old limiting thoughts, feelings, perceptions & imaginal paradigms and create health and wellbeing in the physical body. Based on Quantum Science, this program addresses the unconscious conditioning patterns that contribute to physical disease patterns; specifically tailored to address physical imbalances in the reproductive system, endocrine system; as well as subtle body imbalances in the vital energy centers & chakras. After years observing women and the conditioning patterns that affect the harmony of the reproductive system, Dr. Murciano has identified essential patterns that are interwoven into the unconscious psyche and affects the majority of women in our culture. Fertility Wisdom IVF on-line course “Birthing Love” incorporates four distinctive themes specifically designed to transform these deeply unconscious limiting beliefs, meanings and images common to women experiencing reproductive disorders. Becoming the Mother of Love. Women as vessels of Creation. This is the foundation of our program, a welcoming E-book detailing our complete program and how to use our program. 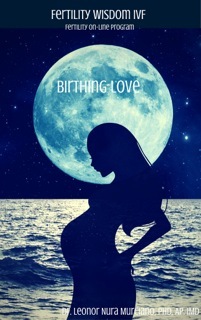 This E-Book will detail the principles of Quantum science and our energetic subtle body’s interrelationship with our physical body, our 4 essential paradigms of Birthing Love, as well as the corresponding Transforming meditations, Cultivation Awareness’s, Reflection Practices & Visualizations for each stage of you IVF process. It will allow you to transform negative stress and empower yourself by understanding the subtle bodies, how they influence your physical body and how to create health and healing by applying the tools we are sharing with you. These foundations of Quantum science incorporated into Quantum Medicine have effectively healed and transformed the lives of hundreds of women and now it is your turn to experience empowerment and healing in your journey through your fertility challenges. Cultivation Awareness, Reflection Practice and Visualizations E-BOOK. In our EBOOK you will also receive one module of the Essential Paradigms of Birthing Love and the corresponding Cultivation Awareness, Reflection Practice & Visualization for each of the four stages during your IVF. Each part of the e-book will present the stages in great detail incorporating the underlining unconscious pattern that affect women negatively and empower you with tools in which to cultivate your healing within. The program is designed to reconnect you with your strength; your deepest passion of mothering within yourself… the passion that has been instilled in your heart… that has driven you to the process of IVF to begin with. This immense force is powerful if you know how to access it. This is part of your journey… accessing your inner potential and releasing all the unconscious patterns in your subtle bodies that may be getting in the way of your potential. The Cultivation Awareness, Reflection Practice & Visualizations are a combination of simple practices and awareness’s to incorporate during the four IVF stages that include breathing, setting intentions, journaling, nature contemplation, transformative thinking and introspection, creating success with your IVF process. (Audio Recordings) approx. 20 min each: You will receive four audio recordings, Transformative Healing Meditations, for each critical stage of your IVF, that can be accessed daily for support on your journey. Now you will have the coaching and meditation audios available to you when you most need it, to use over and over again, empowering you each step of the way. Reduce stress that may be contributing to your infertility. Transform hidden fears, anxieties and worries, quieting the mind and accessing inner strength, peace and healing. Reconnect with your original deep passion of becoming a Mother, allowing that passion to move you through your journey with hope and peace. Release the pain of the past, allowing you to fully engage in your potential for a successful IVF process through practices incorporating principles of Quantum medicine. Rewiring your thinking (mind), emotions & supramental (meanings) to release harmonizing hormones and physical responses that contribute to conception and reestablish the integrity of the reproductive system; endocrine system, womb, sacral chakra, and all corresponding processes, contributing to a successful conception. Create positive outlook releasing old limiting mental and emotional unconscious patterns. Meditations, Cultivation Awareness, Reflection Practices & visualizations. Deep relaxation in physical and subtle bodies, contributing to successful IVF process. We believe that principles of Quantum science, evident in Quantum medicine, offer the key to healing our reproductive, endocrine, and corresponding systems in order to conceive. Through the awareness of Consciousness and the Subtle bodies you are able to empower your consciousness through the four essential paradigms “Becoming Mother of Love, Women as vessels of Creation, Embracing the Feminine Qualities and Mothering yourself” in order to heal body, heart and soul. We believe there are contributing unconscious patterns in your subtle bodies; emotional, mental and supra mental bodies that affect your physical body and these can be addressed in order to create health and healing physically. We believe, as women, we have inherited unconscious cultural patterns that contribute to sense of unworthiness within ourselves and our roles in society. Discovering these and bringing them to consciousness, releases us from the debilitating effect they may have in our physical bodies. In other words, these cultural patterns contribute to our disease and disorders; including the increase we see in fertility issues affecting 15% of our population. We believe our epidemic of infertility is not just a physical problem, it has underlying roots in our meanings, thoughts, emotions and beliefs in relationship to being a women and a mother, whether conscious or unconscious, all undoubtedly reflecting in our physical bodies. We believe the mystery of life contained in women comes from the essence of Love. The force of Love is what allows us to create life. Accessing this deep connection with the nurturing, nourishing force of Love within our own being is key to allowing the physical body to manifest life within itself. Nothing can be born without love. Embodying the source of love deep within our self creates the energetic abundance for life to be born. As a woman, embracing the love for ourselves, for our bodies, for who we are and nurturing, honoring and appreciating our own unique qualities, creates the space for life to be born within us. Through Transformative Meditations, Cultivating Awareness’s, Reflection Practices & Visualizations, applying principles of Quantum medicine, we can affect the subtle bodies and consciousness creating healing in the physical body and empowering your ability to conceive. EVOLUTIONIZE: The process in which one becomes more adequate to function better than those who stood before him. If one wants to function better than they have been, something has to change. Many times the disorders and imbalances we experience in our bodies are a wake up call from the deepest part of our being; as an opportunity to break through our psyche’s limitations and “evolutionize” ourselves to a greater empowered sense reality and of our highest Truth. By acknowledging/realizing our limiting beliefs, thoughts, emotions etc., related to our present condition, we are able to breakthrough into a new paradigm and aligning with the morphogenetic blueprint of restoration in our physical body. Healing is thus available through awareness and listening of our physical and subtle bodies; treating the body and the psyche. Six Weeks of FREE email support with Dr. Murciano.